KAMIZA-AN is the upper level of almost 100 years old Kyoto machiya, traditional Kyoto townhouse. Hairdryer, towels, shampoo, body soap are provided. Each room have an air conditioner. Our New York architect based in Kyoto Geoffrey P. Moussas renovated it to make this old house a special place where to stay with couples and friends during your vacation in this beautiful historical city of Japan. 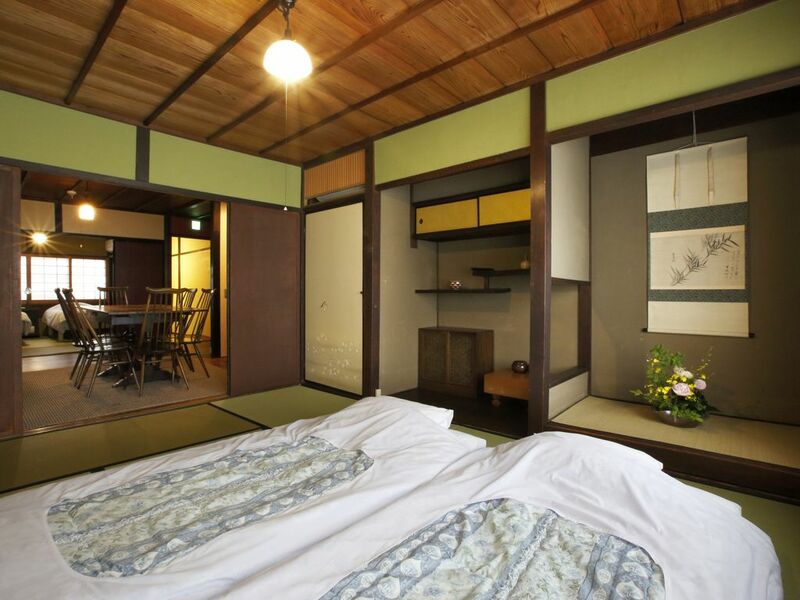 You can experience the old days Japanese life style while having modern amenities. There are two tatami mats rooms where to sleep with futons or beds, a western style living room with table, chairs, sofa, modern kitchen area, antique furniture, nice shower, high-tech toilet, air conditioner, floor heating. It is situated in quiet Kamanza street that in few meters ends in Sanjo street, one of the most old and main streets in Kyoto crossing the city from East to West. This street has been very important in the Kyoto history for many events happened here, and today you can enjoy the craft shops, the old houses, museums, galleries, local temples and shrines, or cafes, restaurants and the very exciting Shopping District, one of the oldest in Kyoto with also the most modern goods and latest fashion, and elegant department stores. Nearby, in the other side of Horikawa street there is a more calm and 60's-70' s years atmosphere Sanjo shopping arcade, where you can find fresh vegetables sold in the street, different kinds of shops, bakeries, supermarkets, good places where to eat... You can relax doing your supper shopping after a day visiting so many beautiful places in Kyoto and feeling as a local! KAMIZA-AN is the perfect place in the mid of cultural, traditional, innovative Kyoto heart! Unfortunately, we can not accept kids, over 2 years old to 12 years old. We can accept under 2 years old and over 13 years old. If you arrive later than 8 pm, please let us know. Person not registrered for accommodation must refrain from staying overnight in the room. I liked the typical 'eel' shape as called in Kyoto (the front side is not so wide and the house extends in length). I thought it could be so nice to preserve this townhouse and make our guests even for few days to live as Kyoto people lived for centuries with traditions plus a more today comfort in the daily house use. The benefits of this townhouse is keeping the traditional sides and add modern touch to satisfy our international guests needs, and also is the location: in central Kyoto but in a quiet street. At five minutes walking distance there is Nijo Castle, where the Shogun lived, old more than 400 hundreds years. Many other places to visit are at a walking distance, like Rokkakudo Temple called the navel of Kyoto connected with the famous ikebana school Ikenobo, the Imperial Park, or colourfull Nishiki food market. Bus stops are very close as banks, post office, museums, galleries, every kind of restaurants, cafes, bars...and more and more! Kawaramachi, Shopping area is 2 train stops away. There are lot of shops, restaurants and many other things to do. 10 min walk to Gion, famous district.